Until September 22nd, 2017, the 80′ Rohn 45G tower supported a Hy-Gain 204BA (4-element, 20m beam) at the base of the mast and a Cushcraft 1504 (4-element, 15m beam) at the top of the mast, about 10′ above the 204BA. The beams were turned by Ham-II rotator which in 2017 stop telling us its direction. 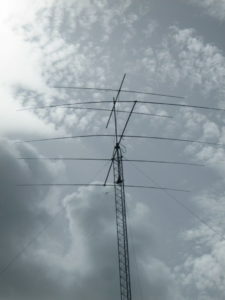 Up until the fall of 1998, the 15m beam was fine; the look of the two 4-element beams was a truly a thing of beauty and a wonder to behold–classic antenna art. Then a small tropical storm came through and we lost half of one half of a director element and the rear third of the boom containing the reflector. The 15m beam had remained a 2.75 element beam for a few years, but the remaining piece finally fell off and was reduced to a 2 element beam… but it still worked! SWR dips at 21.7MHz but there seems to be directivity and gain in the direction it’s pointing. It was still a killer during operations. The 4-element 20 beam also now suffered wear and tear. It no longer resonated in the band and it exhibited an intermittent connection at the fee; therefore, we took it off the air. “The 204BA, 20m, 4-element beam has an interesting history. Back in the early 70’s, I was working in the communications center at here at JSC (back then, it was called Manned Spacecraft Center–MSC). One of our tasks in the COMMCEN (mostly teletype and facsimile) was to operate a couple of Collins-equipped HF stations on the NASA Emergency Radio Network and perform weekly radio checks with the other NASA Centers around the country. A scientist working on a joint U.S. Dept of Agriculture-NASA-Mexican Dept. of Agriculture-Mexican Space Commission project in Mexico had been making daily telephone calls back to JSC to file his activity report. After a few monthly bills had been received in the Telephone Office for the long distance phone calls, someone suggested that the scientist should be provided a radio with which to files his reports. It was decided that sending someone (me) down to his location and setting him up with some Collins radio equipment and antenna/tower hardware would be cheaper in the long run. So, with a KWM-2A, Power Supply, a 30L1 amplifier, a 204BA antenna, fifty feet of Rohn 45G, guy wire, guy anchors, and other hardware, KG5U spent a total of four weeks (two two-week trips) working in and around the small town of Fortí­n de las Flores (Fountain of the Flowers). Fortí­n is an absolutely beautiful, ‘typical’ Mexican small-town, located halfway between Veracruz and Mexico City. While there, some local hired helpers and I installed the tower/antenna (no rotator was needed) and shopped for needed additional hardware in the nearby cities of Orizaba and Cordoba. I quickly got accustomed to the Mexican afternoon siesta time, late dinners, wonderful people, great food, beautiful countryside, and the overall lifestyle. Once the station was all set up and ready to operate, it was a matter of waiting on the license to come through from the Mexican ‘FCC’. Because it was going to take a while, I was recalled to Houston until the license arrived. Once it arrived, I flew down to Veracruz, drove out to Fortí­n and trained Dr. Broce on the operation of the radio equipment. After a week and a half there, making sure Dr. Broce was comfortable with the procedures and operation of the radio and amplifier, I returned to Houston. Until the project was over a couple of years later, Dr. Broce filed his daily reports via the radio station and the HF station in our COMMCEN office where we phone-patched him through to his JSC secretary.